On Second Scoop: Ice Cream Reviews: Friday Night Fight : Which is the best Jon Donaire Ice Cream Cake? Jon Donaire Ice Cream Cake? Welcome to our very first Friday Night Fight! No worries, there's no actual fighting, just scooping, lots and lots scooping. 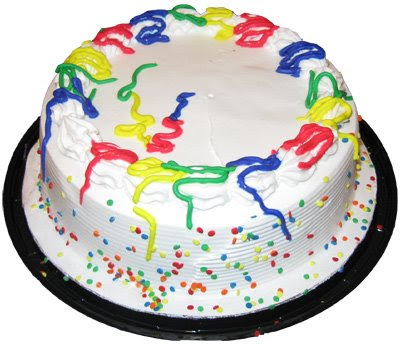 Walmart has been steadily increasing the range of products in their ice cream cake freezer. The very tasty Strawberries & Cream Ice Cream Cake is no longer alone on the shelf. Over the last month we've had not one, but two great cakes from Jon Donaire, both of which were devoured very quickly. Ok, let's get it on! In the yellow corner, Weighting in at one pound, 12 ounces, we have the Amazin' Mouthfuls Chocolate Chip Cookie Dough Jam-Packed Ice Cream Cake (say that 3 times fast!). He may be small, but he's packs his punch at just $9.88! 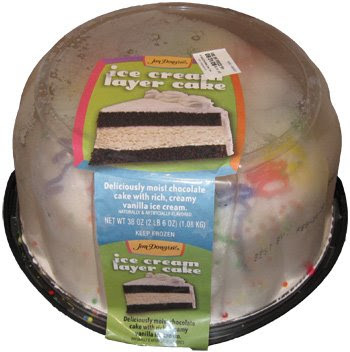 In the green corner, weighing in at 2 pounds, 6 ounces, we have the mighty Ice Cream Layer Cake. 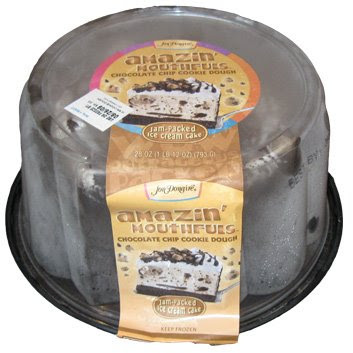 Just $14.88 gets you twelve rounds with "deliciously moist chocolate cake with rich, creamy vanilla ice cream". The covers are off and it's time to see what these guys are made of. 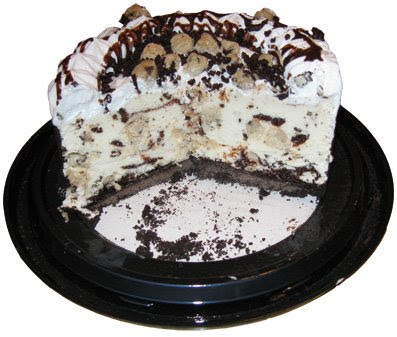 Wow, the cookie dough cake looks awesome, just awesome. A thin layer of oreo-style cookie on the sides accents the chocolate drizzled cookie dough chunks on top. It's ok to stare for a minute. Ice Cream layer cake is no slouch, but he is reminiscent of pretty much every other ice cream cake you've ever seen. It still looks good, but I'm guessing something, or someone, is going to be stained with icing by the end of the day. Layer cake is losing this round, so my daughter comes in to have a quick pep talk with him. 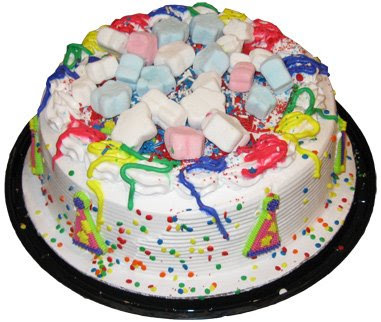 Nothing like 6 kinds of sprinkles, sugar party hats, and festive marshmallows to cheer a guy up when he's down...but layer cake still loses round one. 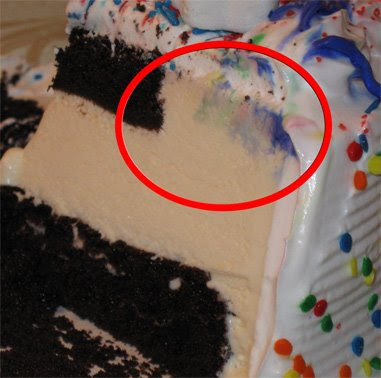 I love ice cream cake and I applaud Jon Donaire for trying to take things up a notch. Let's see what cookie dough has to offer. Looks even better doesn't it? The cookie dough bits go throughout the cake, and there's a hard layer of oreo-type cookie on the bottom. Well, we know layer cake can't match that...or can he? Well, the cake does look very moist, but look at the top: the cake doesn't cover everything. It's a layer of cake on the bottom, a layer of ice cream, and then the top is cake in the center and ice cream on the outside rim. Looks like Jon Donaire is trying to find the perfect cake to ice cream ratio. While the cookie dough cake does look fantastic, the cookie layer on the bottom is extremely dry ...really, really dry. It's a shame because the chocolate adds a nice balance to the mix, but it's easy to get too much of it. We all enjoyed it, and definite points for being different, but I don't love it...ooo, who am I kidding, I still really like it. Layer cake is just that, a really nice, moist cake with ice cream. There's no crunchy Carvel bits here, just tasty cake. Everyone enjoyed the cake, though some leftovers would have been nice! Hmmm, maybe the first fight should have had a more clear cut winner, but honestly, you'll be happy if you buy either one of these cakes. 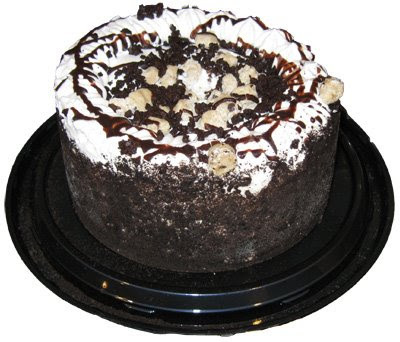 Or think of it this way, the cookie dough cake makes a great family treat, while the layer cake is great for parties. They are both worthy siblings of Strawberries & Cream.